Keb Wisting is somewhere around ninety-five years old (he lost count) and in constant pain and thinks he wants to die. He also thinks he thinks too much. When his grandson, James, a promising basketball player, ruins his leg in a logging accident and feels he has nothing left to live for, Keb comes alive. Together with a rogue’s gallery of colorful characters and a dog named Steve, they embark on a canoe journey deep into wild Alaska and into the human heart, in a story of adventure, love, and reconciliation. Kim Heacox is an award-winning author and photographer. He lives in Alaska and is the author of several books written with a strong sense of place. When not playing the guitar or doing simple carpentry, he’s sea kayaking with his wife, Melanie. 1. Were you immediately hooked by Keb Wisting and drawn into the story or did you have a hard time relating to this unique character? Why? 2. Alaska roots this novel and plays a large part in the overall story line. How does the perception of Alaska as a mysterious and remote place play a part? Why can’t the story have happened anywhere else? 3. Discuss the transformation of the relationship between Keb and James as the story evolves. 4. How does the struggle between tribal and environmental issues affect the story? If similar conflicts are happening where you live, what impacts have they had on you? 5. How does Jimmy Bluefeather shed light on Alaska Native tradition and perception of family and place? How are they caught between times and places and how are they meshing them together? 6. Is there a symbolism between James and the Canoe? 7. What do you think Steve the dog adds to the story? 8. 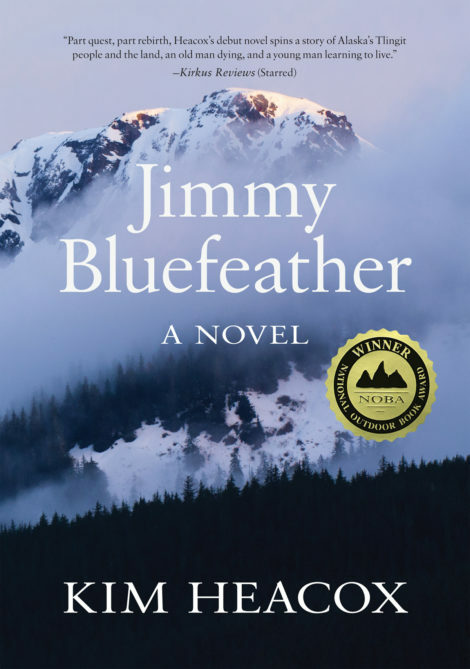 Can you imagine yourself as a character in Jimmy Bluefeather? If so, which one? Or would you be a new character? What role would you play in the story? 9. There are numerous quotes in the book that Kim Heacox has dubbed “Kebisms”—which, if any, resonate for you?